The first simple budget template is great for tracking expenses and financial goals whether you’re on your own or a party of four (or more). You can list out your sources of income as well as track all of your bills with their corresponding due dates and paid dates. No more digging for the checkbook or through your inbox to see if you did indeed pay that cell phone bill. This simple budget template can be printed out and kept in easy reach or stored as an Excel file with auto totaling capabilities. 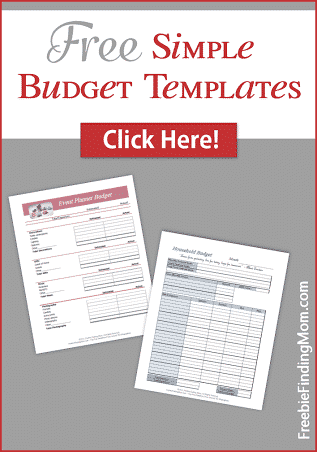 Download your Free Simple Budget Template Printables now! The second simple budget template is specific for event planning. Whether your planning a birthday bash or a family feast for the holidays, this simple budget template can help. Not only will it keep your spending on track, it will also prevent those last minute dashes to the store by serving as a to-do list. The simple event budget template has a column for estimated prices as well as the actual price paid so that you can compare how well you’re doing in terms of staying on budget. Plus, if more than one person is involved, you can add an “assigned” column and list who is responsible for each task. These simple budget templates are easy to use and offer a great return on investment. Bonus: Since these templates are available in an Excel file, you can modify them to fit your specific circumstances. Need some additional tasks added to the event planning budget template? No problem! Need a few extra fields for bills and income on the first simple budget template? Even easier! Are there any additions you think would make these simple budget templates even better? Tell me in the comments!